THX announces 3D certification system for Blu-ray | What Hi-Fi? Its aim is to "eliminate any AV quality and creative flaws long before 3D movies are broadcast, streamed or manufactured on optical disc". Attention will also be paid to interoperability, with THX and BluFocus testing 3D Blu-ray discs and players to ensure they play seamlessly. "The long-term success of 3D in the home depends heavily on content producers and consumer electronics manufacturers delivering a comfortable and compelling experience for today's first wave of consumer adopters," says Rick Dean, senior vice-president at THX. 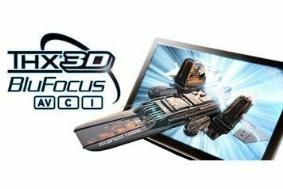 "Our partnership with BluFocus complements the work THX is doing with leading HDTV manufacturers and other industry organisations to drive standards for 3D visual quality and usability." One of the biggest reported concerns among consumers is experiencing fatigue from 3D video and glasses. THX and BluFocus are researching root causes of viewer fatigue to better understand the physiological effects of 3D. The goal is to work closely with content producers to implement best practices and guidelines for all 3D elements, including onscreen characters, objects, graphics and subtitles. THX-BluFocus certification also evaluates how 2D-to-3D conversion adds depth to the picture, and whether this added depth results in creative errors or flaws that deviate from the storyline or causes viewer fatigue. "The added dimension of 3D brings with it more technical challenges than traditional 2D post-production and authoring, and requires more steps in the production chain," says Paulette Pantoja, CEO of BluFocus. "The certification program we are creating with THX will help refine 3D post-production and authoring and help content producers minimise technical flaws long before 3D content is broadcast, streamed or authored on optical disc." • AV Certification – THX-BluFocus AV certification indicates that sound and images have been analysed to ensure they maintain the quality and detail of the original master elements. • Creative Certification – The THX-BluFocus Creative certification indicates that all 3D elements in the feature presentation have been analysed to make sure they are properly focused and in the right location on screen. 2D-to-3D conversions are also analysed to detect creative errors and flaws that deviate from the director's intent or may cause 3D viewer fatigue. Subtitles, menus, graphics and other elements may also be reviewed. • Interoperability Certification - THX-BluFocus 3D “I” (Interoperability) certification applies to Blu-ray discs to ensure they play seamlessly on 2D and 3D Blu-ray players from major CE brands. More than 100 Blu-ray players, from different regions, are evaluated with each THX-BluFocus Disc to deliver a hassle-free user experience. For a full list of THX-BluFocus certified discs, click here.